I just finished reviewing Glupa and Le Putih Soaps and I'll post the full reviews very soon. Yesterday, I received three packages from three different brands and one of them is from Opulence Skin Philippines. Office 3B Kaminari Bldg. , 247-249 Banaue St.
Opulence Skin Philippines is a growing skincare store here in our country. Their products are currently raving around social media and I'm so glad they contacted me to try their products for review purposes. 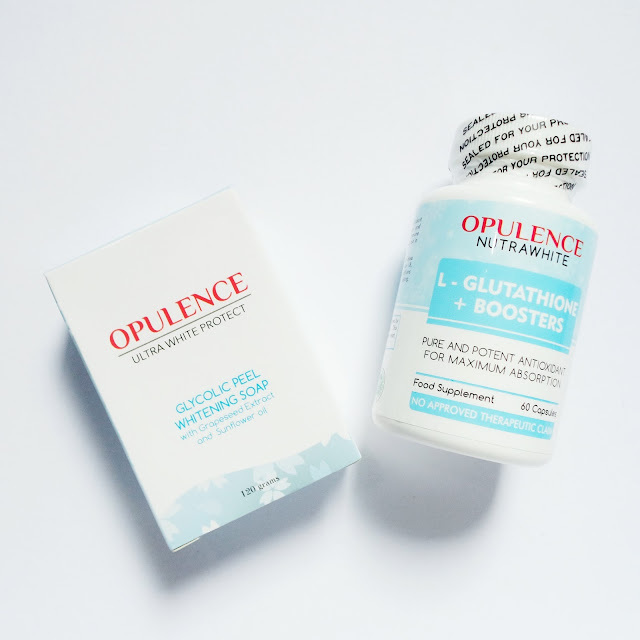 One of their newest creations is the Opulence Nutrawhite Glutathione Capsules which I'll start trying out today together with the Opulence Ultra White Glycolic Peel Soap. I am really excited to try this glutathione pills because it contains Selenomethionine. What is Selenomethionine? It's a potent antioxidant and immune system booster and it promotes both heart and liver health. I'll give you all the details along with the price, smell, and all you need to know on my full product review which I'll be posting once I'm done using them.